One of the more common do-it-yourself jobs undertaken by boaters is installing a transducer for a depth sounder or fish finder. In addition, this one generates more questions for us at the boat store. There are three basic types of transducer installations: transom mount, thru-hull and in-hull. We’ll tackle each one in order. Boat designers have it easy. They sit at their drawing boards and draw beautiful looking boot stripes, at least most of them do. If you look at the boot stripe on most boats, it curves up in the bow and stern, giving a pleasing overall look. It’s easy to draw a sweet, fair boot stripe on a two dimensional piece of paper but wickedly tricky to transfer it to a three dimensional hull. Project creep is when you start out to build a Mini-Cooper and end up with a bus. It’s endemic in a boat restoration project and Daydream is no exception. If you remember back to the first Project Daydream article, my daughter and I were going to restore Daydream on a budget and to a timeframe. We’ve resisted project creep as best we could, but it’s time for me to admit a certain amount of defeat on that subject. Sounds somewhat dramatic, doesn’t it? Drama aside, it doesn’t hurt to be prepared for an emergency afloat. This time, we’ll be talking about things you can have aboard to help in the advent of a serious leak in the hull. "I have at least one loose rivet under my floor somewhere. Is there some product that I can paint on the bottom of my fishing boat (14') that will seal it up and hold up fairly well?" I don't know of any paint that will hold up well and seal loose rivets. You could smear 3M5200 around the rivets but it would eventually peel off. 1. Locate the leaking rivets. Prop the boat up and spray water inside to locate the loose rivets. 2. Dry thoroughly and sand the area around the rivets with 120 grit to remove any paint and provide some "tooth" for the epoxy. 4. Etch the area with WEST 860 Aluminum Etch Kit. 5. Mix and apply a layer of G/Flex epoxy. Are you tired of refinishing the wood aboard your boat? Has a wooden part aboard your boat rotted and needs replacement. Do you want durable and easy to clean surfaces aboard your boat? Something you can just wash down with a hose and not worry about drying? Several months ago, I talked about filling in holes in Daydream. I patched two thru-hull openings, one for the overboard head discharge and one for a redundant transducer thru-hull. Now that the entire boat, inside and out, has been sanded and the first coats of paint are being applied, it’s time for me to actually start making some holes in the boat, or at least remaking some. A Columbia 26 has two deck drains and two cockpit drains, one of each on each side. Both drains on one side of the boat meet at a tee at the top of a seacock which in turn is fastened to a thru-hull. The old drains were pitted and dull. We decided to remove them temporarily to make painting the deck and cockpit easier. 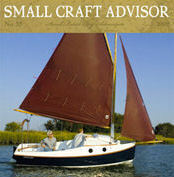 subscriber call asking about how best to treat rust on his Cal 20 keel. "Do you think Paul would consider it?" Well, it just so happens that my daughter and her friend just completed a keel job on their boat. It’s a little bigger than the Cal 20, but the principles are the same. Here goes! When I first purchased Ternabout, I was also doing a lot a marine carving, especially half-hull models. One of the first jobs once Ternabout was in my driveway was to scrape off the old hull numbers in preparation for installing the new ones. A reader recently asked about making his hull smooth. It seems he did some major repair work on his hull and it didn’t look “smooth”. Now, in nautical lingo, a smooth flowing hull is called “fair” and the process of making the hull smooth is called “fairing”. A fair hull not only looks better but usually performs better too. Certain classes of racing sailboats go as far as to make templates to fair their keels and rudders. This ensures that those foils are of optimal shape and that all similar boats are, in fact, similar. A recent post here on The Virtual Boatyard covered a process for replacing a rotted and water saturated transom. That process required cutting away the interior fiberglass layer, bonding in a new plywood core and re-laminating the interior transom wall. At best, this is no small task and requires the internal equipment and structure around the transom to be removed for access.